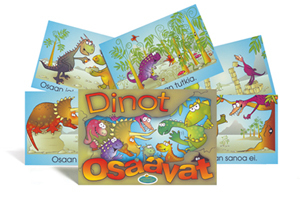 Dinot Osaavat (the Finnish edition of Can-Do Dinosaurs) is designed to help adults introduce children to the critical skills needed for safety, self-reflection, resilience and interrelationships. Featuring a herd of 28 dinosaurs direct from the Jurassic era, this resources carries a timeless and invaluable message for children—that they can learn and grow by focusing on what they can do, rather than on what they can’t. 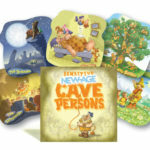 The cards are ideal for helping children overcome fears, develop confidence, build friendships and make good decisions. They’re also great for helping children acquire the skills of turn-taking, listening and assertiveness! Ask young children to sit in a circle. Invite each child to pick a card and demonstrate how they do the action shown on the card. Notice what your students or children do well. Acknowledge them with the appropriate card or sticker. Ask children to choose a dinosaur they would like to invite into the classroom/kitchen/bedroom today. Create a collage or painting with them based on the card’s theme. Invite children to scan the cards and pick skills that could be used to stay safe (eg. ‘I can tell others’, I can be angry’ and ‘I can be safe’)? Which of these skills need practice? Which ones come more readily? These engaging, easy-to-use skill-building cards are ideal for children aged 3 to 7 years old. Minimal text ensures the cards accessible to both literate and pre-literate youngsters.